Bridgwater stands on the River Parrett. The area has been known to have been settled for at least a thousand years. In the Domesday Book, it is described as an agricultural community with the name Brugie, although it is easy to see how the name Bridgwater evolved. It is recorded that William de Bruere was granted a Royal Charter for the borough at the beginning of the 13th century, when he began building a castle here. By the 15th century the town had become a thriving port. 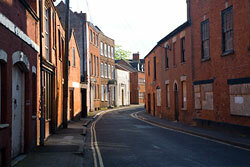 As with several other centres in this area, the town’s prosperity was mainly to do with the cloth industry. There was a major siege during the English Civil War when the town supported the Royalists. The Parliamentarians attacked the town and most of the timber framed buildings were destroyed. When the town was taken, the victors destroyed the castle. During the late 18th and early 19th centuries, the cloth trade began to decline as a result of the industrial revolution. Larger northern towns, where labour was cheap and plentiful, became the centres of industry. Bristol grew in importance and the port of Bridgwater began to decline. The manufacture of bricks and roofing tiles gave the town a boost after the arrival of the railways. But this industry was replaced by others during the 20th century. The mediaeval street pattern has been retained in the old centre of Bridgewater and there are still a number of attractive historic buildings. There is also a statue of Admiral Blake, one of the town’s most famous sons, in the town centre. The birthplace of this sailor and parliamentarian, who was born at the end of the 16th century, is now a museum. 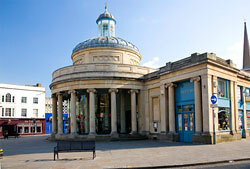 Today the town is famous for Bridgwater Fair, which has now been combined with an illuminated carnival. The fair takes place during the last week of September and has been held in the town since 1249. It was originally a livestock fair and this function still survives. However the main event is now centred around a fairground with all its attractions. 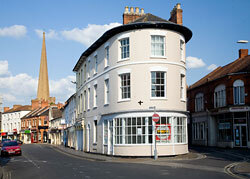 Bridgwater has plenty of accommodation, restaurants, bars and cafés. It also has plenty of shops and other tourist facilities, making it an ideal centre from which to explore Somerset and neighbouring counties.